A report by PolicyLink (a national research and action institute advancing economic and social equity), outlines successful strategies that have been used to help businesses survive and thrive in Seattle, Washington, and St. Paul, Minnesota. The right type of financial assistance must be available to meet business’s needs. Outreach to businesses should begin well in advance of construction. Business technical assistance is vital. Communication is Key - Projects can have unpredictable timelines. Strong advocacy and organizing by multiple partners (e.g., foundations, non-profits, government, private sector, universities, etc.). In both Seattle and St. Paul, the cities played an important leadership role. In Seattle, a $50 million Community Development Fund ("CFD") was created. 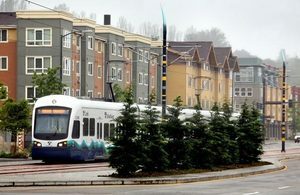 The CFD was largely funded by the City of Seattle, which contributed $35 million of Community Development Block Grant ("CDBG") funding over seven years and $7.8 million from the City's general fund. Qualified small businesses could apply for CFD funds for such things as relocation costs; business interruptions payments; and low-interest loans for advances related to operations, equipment, and tenant improvements. After construction of the affected rail line in 2009, the retention rate was 85 percent for all businesses, and 90 percent for businesses that had received assistance. The City of St. Paul created a $4 million Ready for Rail Business Support Fund through a Joint Powers Agreement between the Met Council and the Housing and Redevelopment Authority of the City of St. Paul. The loan fund was originally seeded with a small grant by the Central Corridor Funders’ Collaborative, The Met Council, and the City of St. Paul. The fund is administered by two local nonprofits. In addition to the loan program, 40 business and community leaders came together to form the Business Resources Collaborative ("BRP") to support small businesses through the construction process. In partnership with community development organizations, they hired “small business consultants” to do extensive outreach to the businesses along the corridor. Assistance provided, to about 95 percent of qualifying businesses, included support with accounting, taxes, and marketing. About $1.2 million was spent on direct technical assistance primarily funded by the Central Corridor Funders’ Collaborative, St. Paul Foundation, and Bigelow Foundation. Due in large part to the work of BRP and its collaborators, of the 1,144 businesses located along the corridor, 84 closed or relocated, and 84 new businesses opened. Nearly two-thirds of businesses expected their sales would increase, post construction. For more, read the full report, Business Impact Mitigations for Transit Projects, PolicyLink, November 2013.